This bundle contains 23 products. You save 44% from the $877 regular price! 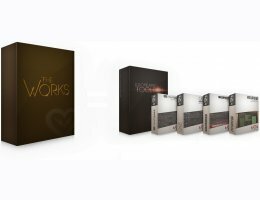 The Works contains every piece of software Kilohearts has ever released. That means you get, not only the awesome value of the Kilohearts Toolbox with its myriad of effects, but also the acclaimed effects Disperser and Faturator! Both of them also work as snapins in the Snapin host plugins you know? Speaking if which: The most versatile band-splitter on the planet, Multipass is included to give you the most out of your Toolbox effects. And since Kilohearts are practically giving stuff away here, they threw in the kHs ONE subtractive synth for good measure. All of this for half of what you would pay if you bought them individually. This Bundle of plug-ins includes "Multipass" their award-winning band-splitter, Toolbox, and all their effects to be used as building blocks to construct your sound(s).